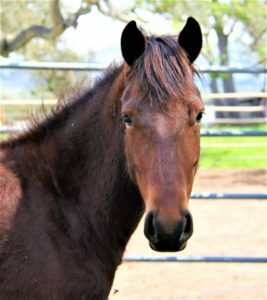 United Mustangs of America Coach, Monica O. Krause, picked up Mustang Raven at the Ridgecrest, CA BLM holding facility on February 20th, 2018. Before that date, she was just a number… 144187145. Upon the mare’s journey out to Central Coast California, Monica saw many large black birds catching her attention on the side of the road. So, she thought, that’s a great name! Raven! Even though she is not a black horse, like the black bird, the name possessed distinction and power and seemed to stick. Raven was captured in the Reveille HMA (herd management area) on February 2, 2017. She is bay, has one star and no other markings. In July 2017, the BLM measured her at 13.2 hands tall. This year, 2018, she is 4 years old. Her mane lays on her left side covering the freezemark from the government. When Monica was able to touch her forehead for the first time, she noticed a small bump that fit in her palm just under the forelock. She calls this her unicorn horn. Raven must be magical! Especially since she has found her way to the Shire for her introduction to life with people, right?! She is proving herself to be a quick learner and coming alone nicely on her path to becoming a riding horse. Raven will be a great horse for someone when the time comes. 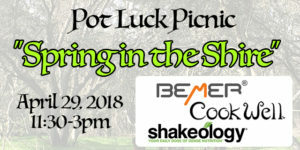 Come and meet her at our special FREE “Spring in the Shire” event held on April 29th, 2018. 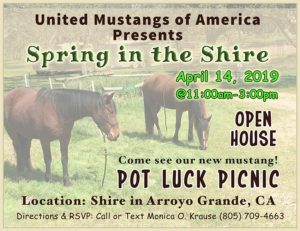 To RSVP, click here. Look forward to seeing you there.